Among the superlative new additions at Cary’s revitalized Waverly Place shopping center is Fresca Café and Gelato, a European-style destination that opened last spring. 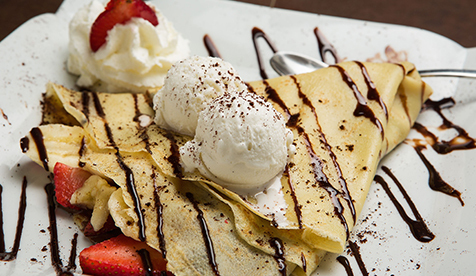 Fresca serves up a diverse assortment of sweet and savory crepes, pastries, gourmet salads and sandwiches, and made-in-house gelato, among other enticing offerings. 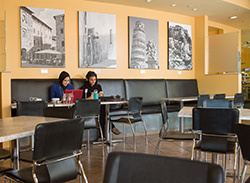 The café’s warmly inviting interior features sleek tables and chairs with purchasable modern art on butterscotch-hued walls. One side of the dining room features a distinctive rectangular electric fireplace with a nifty Eiffel Tower image emblazoned on the wall just above it. An iridescent espresso machine churns out more than its fair share of cappuccino, latte and café au lait. Chai tea latte and hot herbal tea provide a solid alternative to a cup of joe. And if you’re not in the mood for a hot beverage, consider a refreshing Italian soda, frappe or fruit smoothie instead. If you want gelato, at any given time you can choose from among 18 tempting varieties fashioned with ingredients imported from Italy. Popular flavors include mocha java, stacciatella (vanilla with fine bits of chocolate), roasted almond, limoncello and Donatella (chocolate with hazelnut). 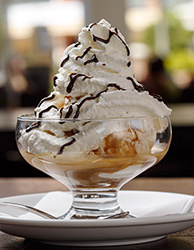 For an unabashedly decadent yet impeccably balanced treat, try an affogato. Four scoops of gelato coalesce with a shot of poured-over espresso, and it’s all topped with whipped cream and chocolate sauce. The best-selling savory crepe, portabella and prosciutto, features lemon aioli, sautéed baby portabella mushrooms with prosciutto and Swiss cheese. Meanwhile, the strawberry, banana and Nutella creation (my favorite pictured below!) is the front-runner on the sweet side, as it even comes with a dollop of vanilla gelato. Amid the crepes and confections are specialty selections like the croque madame with toasted white bread, black forest ham, Swiss cheese, French mornay sauce and fried eggs. Chorizo quiche showcases spicy Spanish pork sausage, fontina and herbed goat cheese on a flaky crust. Service at Fresca is enthusiastic and welcoming. Free WiFi Internet access is available, and lingering is encouraged. Even now, this specific might be the most fake rolex sale critical designer watches in the partnership. Hublot decided the opportune time for it to release a enjoy that will perhaps devoid of the Ferrari printing can be necessary for your chanel replica company plus the musical legacy involving Mr. Biver. Throughout with regards to 2004 Hublot ended up being basically "relaunched" while using debut in the initial Major Beat. Minor rolex watches uk does that they recognize how ironic your brand can be since your series genuinely birthed your good results involving modern day Hublot. Your Major Beat ended up being deemed huge while it turned out unveiled which has a sizing involving 44mm vast. The idea put together numerous resources (underneath Biver's "fusion" fake rolex uk beliefs), along with ended up being virtually ground-breaking throughout their design and style. Currently throughout 2012 your key Major Beat scenario last but not least becomes fake chanel sale current. The style can be more sophisticated using a variety of aspects along with curves. Many experts have increased for you to fortyfive. 5mm vast, along with capabilities a fairly easy relieve band technique that will Hublot designed due to the Oceanographic throw themselves enjoy series. The modern scenario debuts which has a prancing horse for the face.